Its time for some rage faces on your phone! Download Trollface Photo Editor Pro and have incredible fun editing your pics with the funniest stickers ever! Colorful design in happy colors! Intuitive tap controls suitable for all users! A huge collection of rage face funny stickers! Text on image picture editor! Instagram, Facebook, and Twitter sharing options! A perfect way to get rid of boredom! Trollface Photo Editor Pro is a brand new photo editing app which will provide you with hours of fun and entertainment. Edit your pics in a lovely manner with hilarious collection of rage face stickers that we have designed especially for you. Add funny text to photos to make them even more interesting and surprise all your friends by posting them on Facebook, Twitter, and Instagram. Dont hesitate get this free image editor from GP today and enjoy your pic editing experience. The rage face photo booth offers you colorful design in happy colors: red, orange, yellow, green, blue, velvet, and purple. The controls are simple and intuitive and therefore all generations of users will have no difficulty using it. It is suitable for kids, teenagers, and the adults. The kids will have enormous fun adding various trollface memes to their selfies or pictures of their friends. The teenagers will make fun of their friends on all social networks. The adults will add some laughter into their serious lives. There is something for everybody, so you can download this wonderful funny face creator now! Trollface Photo Editor Pro contains a collection of rage comics face stickers that you will simply adore! Selfie mania is on its peak, so you should definitively take a selfie now, choose a photo sticker that goes well with your personality, and post it to all social networks. Combine your edited pics with some Instaframes and post them directly on Instagram so that all your followers can see how hilarious these rage faces are. Let the photofunia begin! 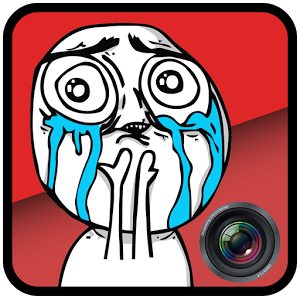 This rage face image editor will offer you a lovely photo montage for your selfies and group photos. Beautify your favorite pics with meme stickers that this awesome face changer app offers you and make all your friends laugh like crazy. Theres a wide choice of rage comics characters such as Challenge Accepted, Me Gusta, College Freshman, Success Kid, I too Like to Live Dangerously, Annoying Facebook Girl, and many more. If you are a fan of photo editing, creating collages, and taking selfies, this rage comics app is an excellent choice for you. Photography apps are currently very popular, so if you want to fit in, you should definitively have this funny image editor software on your phone. We offer you a chance to become a celebrity among your friends by making everyone laugh like crazy every time you go out. Its nice to make people feel good, so start editing images with funny face stickers now and create some nice picsart!